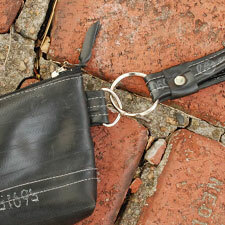 I combined my accessory bag with my key chain to make a super versatile wristlet. You can always remove the strap and use it separately. The bag has a 1 inch bottom so you have plenty of room to store a coin purse, card wallet, a cell phone and lip gloss. And it’s still small enough to put in a bigger purse or backpack if you like to carry lots of stuff with you. The inner diameter of the keyring is 1 1/4″. Plenty big for a healthy set of keys. the strap is approximately 10 inches in circumference – plenty big for your wrist. A silver metal rivet holds it together. The zippered top features a bicycle chain link zipper pull. 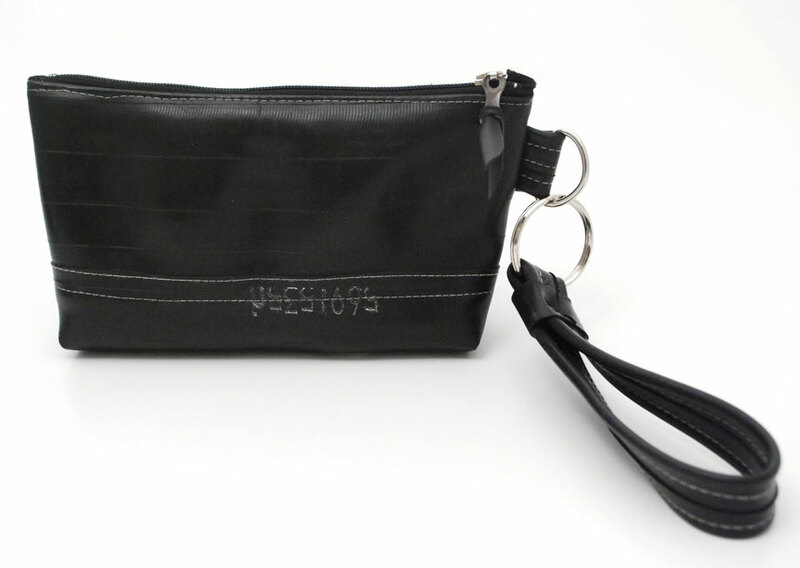 It’s a versatile bag made from recycled bike inner tubes, and the gray top-stitching gives it some extra style. Measures approx. 7 inches wide by 4.5 inches tall with a 1 inch bottom width.